Paul Schaal was more than a slick-fielding third baseman. Schaal didn’t shy away from his defensive reputation. Just survey the years he indulged Topps photographers with the same “crouch with glove outstretched” famous pose. Schaal did his share of hitting in more than a decade with the Angels and Royals. 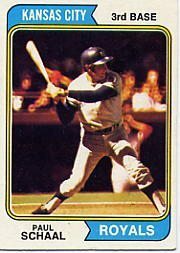 His favorite target was “Sudden” Sam McDowell, who surrendered three homers. Another pitcher Schaal hasn’t forgotten is Boston’s Jose Santiago. A 1968 beaning brought a fractured skull, putting Schaal’s career in doubt. Hospitalization and a trip back to the minors were his first hurdles in a comeback. Inner ear problems would remain. Cardboard Icons is a fascinating blog. This post about Schaal and his 1970 Topps card will have you double-checking all those old card backs. Tomorrow: Schaal shares his gratitude.